Art. 1 The competition is open exclusively to still wines made from the grape variety Mueller Thurgau. Art. 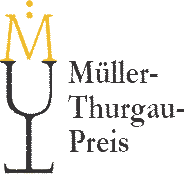 2 Mueller Thurgau , Rivaner- and Riesling x Silvaner wines of the 2018 vintage from all over the world are eligible to compete. Art. 3 The wines in the competition are not allowed to be sold in the Discount. Only bottles with a maximum volume of 75 cl are allowed to compete. Art. 4 Wines can be submitted by wine estates, cooperatives, commercial wineries, importers and distributors. Category V: lusciously sweet specialities from 90g/l residual sugar (Botrytis wines & Eiswein). Beside the vintage 2018 the vintages 2016 and 2017 are allowed to compete in this category! Art. 6 Every participant (see Art. 4) can submit a total of four wines. Art. 7 a) At the time of registration, at least 600 bottles of wine must be available. b) At the time of awards at least 30 bottles of every prize-winning wine must still be available. The participants of the competition allocate 12 bottles of the prize-winning wine for the award ceremony. Art. 8 The entry fee is 42.- EUR incl. 19% Mehrwertsteuer for each wine. Participation is only possible after the fee has arrived. Art. 9 Every wine submitted must be accompanied by a fully-completed wine profile form and must be sent costs and insurance free. Art. 10 Wines that are registered in a wrong category will automatically be placed into the correct category based on residual sugar and alcohol content. Art. 11 Timing: registrations will be accepted from 01 April 2019 until 30 April 2019. Art. 13 Wine samples must be submitted no later than the 30 April 2019. Late entries can not be considered. Art. 14 The tasting will be conducted from BodenseeWein e. V. through independent panels. Art. 15 All wines submitted will be tasted blind and evaluated according to the officially recognized scoring system of the DLG. Art. 16 The decision of the jury is final. Art. 17 The first, second and third place winners in each category as well as the top 30% will receive an award. Art. 18 Awards will be presented at a ceremony in the Vineum of Meersburg for the winners on the 2 July 2019.